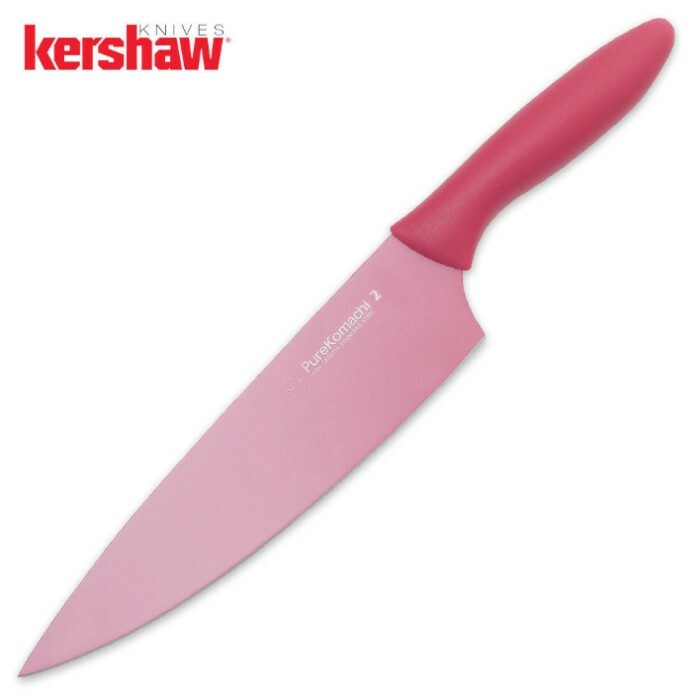 The Kershaw PureKomachi 2 Chef Knife is a real eye-catcher. Featuring an 8 in. blade of high carbon stainless steel, Komachi knives are color-coded to prevent cross-contamination and make it easy for you to choose the right knife for the job. Colored with a food-safe, FDA-approved resin and non-stick coating, Komachi 2 blades are made to glide through food easily, make cleaning simple and prevent corrosion. PureKomachi 2 knives also feature ergonomically contoured, lightweight and comfortable handles. So I've been buying these as gifts for my brother and his wife for Christmas. I would buy them one every year and always hear about how awesome they were but never tried one for myself. During my last visit to my brother's, I finally had the opportunity to use one. It cut through a bagel like a hot knife through butter. I really wish they sold as a set. They are completely worth it and don't waste your money on expensive ones! Kershaw is an awesome brand as it is.